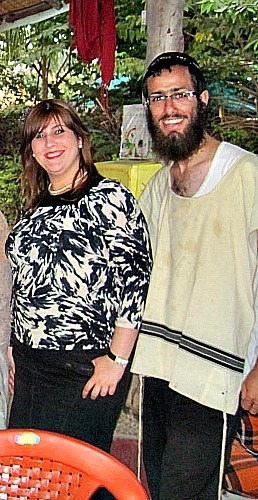 Moti and Libi Gromach are Lubavitch emissaries to a picturesque rocky-hilled, Temple-filled village in India called Hampi. Wow. What a powerful reminder of the importance of mikvah! Why don’t you just go to a lake or a stream? Or the ocean? Why does it have to be a swimming pool? Wow! What a powerful reminder of how exiled from the land people have become. a mikva is not a swimming pool but rather a complicated structure in which one “pool” of “living waters” is connected and mixed with a pool of regular clean water in which the woman immerses. not all lakes or streams meet the torah defined term of “living waters”. a ocean is considered “living waters” however not everyone has these bodies of water near them. I personally know a number of women who are chabad emissaries in other remote places who sometimes have to fly to the closest mikvah. Wow, I will never complain about my 35 minutes drive or icky shower again! 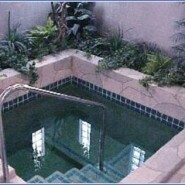 I sure miss going to mikvah….. Lucky lady….and what a powerful lesson 34hours and $500 to go to mikvah – May we all be zoche to continue and expand our relationship with Hashem as this Libi does and appreciate that things are so easy, inexpensive, and convenient for us here with regard to mitzva performance. Reminds me to my grandmother a”h. She lived in Malmo, southern Sweden where there was no Mikva and had to trek monthly to Copenhagen-Denmark by ferry to visit the Mikva! There was no such a thing as returning that same evening. I don’t get it, I just looked at the town on Google maps. It’s right beside a river and close to a huge reservoir and several lakes. Why does she think she needs to davka go to a mikvah? Hopefully, someone gives her a halacha update after this article. Imagine how much more chesed she could do with an extra $500 a month. Perhaps once their family expands, she’ll rethink the importance of this 4-day journey and use the natural water sources in her area. I thought it was just me that thought this was insane. In India, most bodies of water are heavily polluted and not able to be used for mikvah. I assume there is no clean/kosher body of water around…. i’m not in her situation, I can’t judge what is possible and what isnt’, but I do know this: I go to so much trouble to cover myself up and dress modestly, also at the beach and pool, I don’t know how easy it would be for me to strip off in the open, no matter how isolated….. maybe it’s the same for her.